A National Book Award winner and the conclusion of the MARCH trilogy. Congressman John Lewis, an American icon and one of the key figures of the civil rights movement, joins co-writer Andrew Aydin and artist Nate Powell to bring the lessons of history to life for a new generation. A galvanizing account of his coming-of-age in the movement, it’s a capsule lesson in courage of conscience, a story that inspires without moralizing or simplifying in hindsight ... more movement blueprint than civil rights monument, avoiding the Old Testament spectacle of good versus evil in favor of the clashing visions and fractious passions of those pledged to the same fight ... Vivid and dynamic, yet easily accommodating political nuance, this [graphic novel] form lends itself to depicting the complex confrontations and negotiations of a wide range of individuals ... Emphasizing disruption, decentralization and cooperation over the mythic ascent of heroic leaders, this graphic novel’s presentation of civil rights is startlingly contemporary. Lewis may be one of the 'great men' of the movement, but his memoir is humble and generous. In word and in image, Lewis, Powell and co-author Andrew Aydin have successfully hit a literary height ... In Powell’s stunning near-photo-negative effect, we suddenly are placed within Lewis’s hazy point of view ... rattles you viscerally even as it propels you visually ... 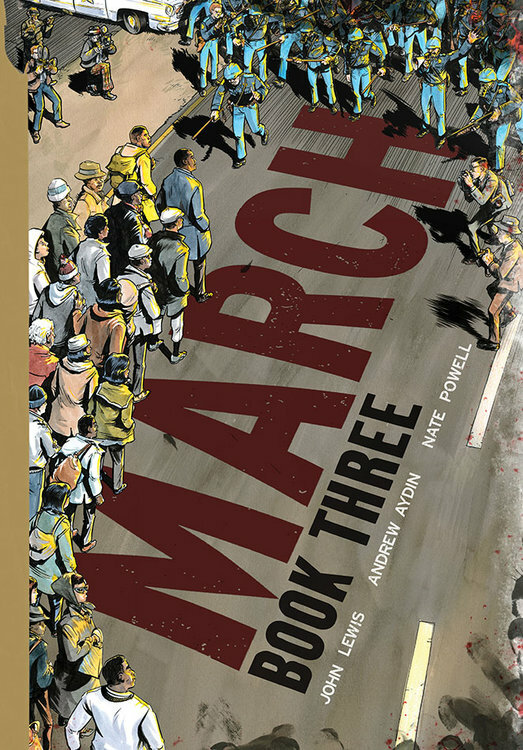 In illustrating a must-read history book, Powell has also provided a graphic novelist’s textbook ... March: Book Three is an achievement on many fronts, including a narrative that builds like the arc of a long bridge. And among the highest accomplishments here is profoundly virtuosic art that measures up to the content of the characters, and the import of the story. March testifies not just to the successes of an earlier social movement, but also to the continuing necessity for African Americans to assert their personhood and citizenship in a society that dehumanizes them ... Powell communicates this sense of dread through his use of shadow, and also by focusing his illustrations on the eyes of his figures ... March distinguishes itself precisely because it brings those people and their sacrifices back to us. What did you think of March: Book 3?